"Things like this don't always come along, but when they do, that is the real 'joy of the discovery' component of Earth science," said co-author Dustin Schroeder, an assistant professor of geophysics at Stanford University's School of Earth, Energy & Environmental Sciences (Stanford Earth). "This paper not only highlights this component's existence, but gives you a way to observe it in time." 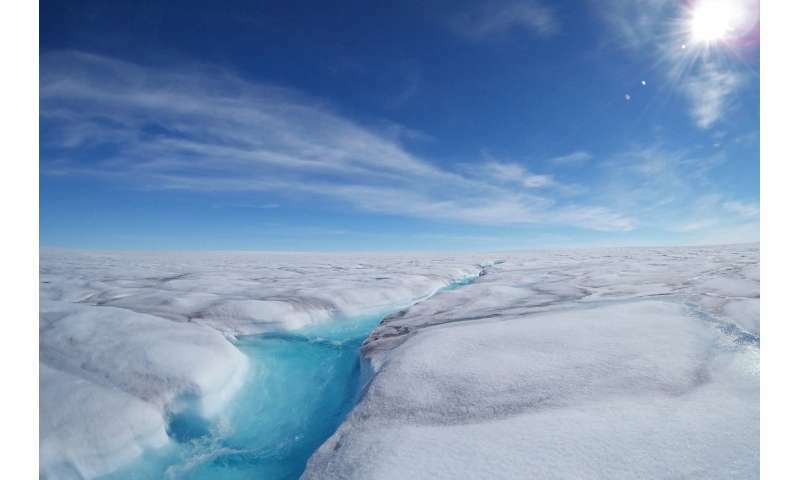 Surface meltwater plays an important role in Greenland by lubricating the bottoms of ice sheets and impacting how retreating glaciers are affected by the ocean. The process of how the glaciers melt and where the water flows contributes to their behavior in a changing climate, as these factors could alter glaciers' response to melting or impact the timeline for sea-level rise. Knowing that some liquid is intercepted within glaciers after melting on the surface may help scientists more accurately predict oceanic changes and help people prepare for the future, Schroeder said. "All of our predictions of sea-level rise are missing this meltwater component," Schroeder said. "I think we're only just realizing how important it is to understand at a fundamental physical scale what glacier meltwater does on its way from the surface to the bed." "This is a new way you could use these instruments to answer scientific questions – instead of just looking at changes in the ice thickness, we're also looking at changes in the ice properties itself," said co-author Winnie Chu, a postdoctoral researcher in Schroeder's lab. "Alex set up the groundwork for trying to understand how this meltwater storage changes through time." "The water system of Greenland is critical for understanding what's happening on the planet," said Schroeder, who is also a fellow at the Stanford Woods Institute for the Environment. "This component Alex has discovered shows that there is a piece of this glacier in particular – and maybe the entire Greenland hydrologic system in general – that we just were not modeling or thinking about in this way."